The fund pursues long-term capital appreciation. They define themselves as conservative value investors whose first strategy is “do not lose money.” As a result, they spend substantial time analyzing and minimizing the downside risks of their investments. 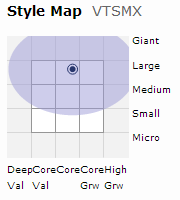 They generally invest in a fairly compact portfolio (around 30 names) of U.S. common stocks. They start with a series of quantitative screens (including the acquisition value of similar companies and the firms’ liquidation value), then examine the ones that pass for evidence of fiscal responsibility (balance sheets without significant debt), excellent management, a quality business, and a cheap stock price. They believe themselves to have three competitive advantages: (1) they are willing to invest in firms of all sizes. (2) They’re vigilant for factors which the market systematically misprices, such as firms whose balance sheets are stronger than their income statements and special situations, such as spin-offs. And (3) they’re small enough to pursue opportunities unattractive to managers who are moving billions around. Frank Capital Partners, LLC. Monique M. Weiss and Brian J. Frank each own 50% of the adviser. Brian Frank is Frank Capital Partners’ co-founder, president and chief investment officer. He’s been interested in stock investing since he was a teenager and, like many entrepreneurial managers, was a voracious reader. At 19, his grandfather gave him $100,000 with the injunction, “buy me the best stocks.” In pursuit of that goal, he founded a family office in 2002, an investment adviser in 2003 and a mutual fund in 2004. He was portfolio co-manager from 2004 – 2009 and has been sole manager since November, 2009. He earned degrees in accounting and finance from New York University’s Stern School of Business. As of the latest SAI, Mr. Frank manages one other investment account, valued at around $8 million. 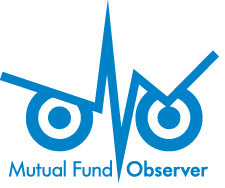 The Frank Value Fund has seven times been awarded as a Wall Street Journal Category King in the Multi-cap Core Category. Mr. Frank has between $100,000 and 500,000 invested in the fund. All of the fund’s trustees have substantial investments (between $10,000 and 50,000) in the fund, especially given the modest compensation ($400/year) they receive for their service. $1500. The fund is available through Schwab, NFS, Pershing, Commonwealth, JP Morgan, Matrix, SEI, Legent, TD Ameritrade, E-Trade, and Scottrade. If a fund manager approached you with the following description of his investment discipline, how would you react? We generally ignore two out of every three opportunities to make gains for our investors. Our discipline calls for us to periodically pour money into the most egregiously overpriced corner of the market, often enough into ideas that would be pretty damned marginal in the best of circumstances. ‘cause that’s what we’re paid to do. Brian Frank reacts in about the same way you did: admiration for their painful honesty and stupefaction at their strategy. As inexplicably dumb as this passage might sound, it’s descriptive of what you’ve already agreed to when you buy any of hundreds of large mainstream domestic equity funds. Mr. Frank believes that a manager can’t afford to ignore compelling opportunities in the name of style-box purity. The best opportunities, the market’s “fat pitches,” arise in value and growth, large and small, blue-chip and spinoff. He’s intent on pursuing each. Nor is that distribution static; the current style map is modestly more focused on growth than last quarter’s was and there have been years with a greater bulge toward small- and micro-caps. But all versions show an incredibly diverse coverage. What does the large-cap growth or small-cap value manager do when there are no good opportunities in their style box? They hold cash, which lowers your exposure to the equity markets and acts as a lead-weight in bull markets, or they invest in companies that do not fit their criteria and end up taking excess risk in bear markets. Neither one of these options made any sense when I was managing family-only money, and neither one made sense as we opened the strategy to the public … Our strategy is quantitative, meaning we go where we can numerically prove to ourselves there is opportunity. If there is no opportunity, we leave the space. 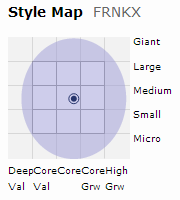 That breadth does not suggest that FRNKX is a closet indexer. Far from it. Morningstar categorizes equity portfolios into eleven sectors (e.g., tech or energy). At its last portfolio report, Mr. Frank had zero investing in four of the sectors (materials, real estate, energy, utilities) and diverged from the index weighting by 50% or more in three others (overweighting financial services and tech, underweighting consumer stocks). Because the fund is small and the portfolio is focused, it can also derive substantial benefit from opportunities that wouldn’t be considered in a huge fund. He’s found considerable value when small firms are spun-off from larger ones. Two of three recent purchases were spinoffs. New Newscorp was spun-off from Rupert Murdoch’s Newscorp and, while little noticed, the “mishmash of global assets in New Newscorp, represent[s] one of the best upside/downside scenarios we have seen in a long time.” Likewise with CST Brands, a gas station and convenience store operator spun off from Valero Energy. All of this would qualify as empty talk if the manager couldn’t produce strong results, and produce them consistently. Happily for its investors – including Mr. Frank and his family – the fund has produced remarkably strong, remarkably consistent returns. It’s in the top tier of its peer group for trailing periods reaching back almost a decade. The manager tracks his fund’s returns over a series of rolling five-year periods (08/2004-08/2009, 09/04-09/10 and so on). They’ve beaten their benchmark in 45 of 45 rolling periods and have never had a negative five year span, while the S&P500 has had seven of them in the same period. FRNKX has also outperformed in 80% of rolling three-year periods and from inception to September 2013. That led Lipper to designate the fund as a Lipper Leader for both Total Return and Capital Preservation for every reported period. Winning is hard. Winning consistently is incredibly hard. Winning consistently while handicapping yourself by systematically, structurally excluding opportunities approaches impossible. Frank Value has, for almost a decade, won quietly and consistently While there are no guarantees in life or investing, the manager has worked hard to tilt the odds in his investors’ favor. This entry was posted in Stars in the shadows on October 1, 2013 by David Snowball.